Rob Giampietro comes from Minneapolis, and graduated from Yale University in 2001 with a BA in Fine Art. Kevin Smith, from Connecticut, graduated from the University of Hartford’s Hartford Art School in 1999 with a BFA in graphic design. Q1. What do you think is meant by ‘the canon of graphic design history’? For example: The Bauhaus? Beck’s Underground diagram? Alvin Lustig’s book covers? Swiss Modernism? George Lois’s Esquire covers? Wim Crouwel’s New Alphabet? Milton Glaser’s ‘I [heart] NY’? Barney Bubbles? Ray Gun? Do you ever think about it, or buy design history publications? A1. The canon is a group of individual works generally agreed by practitioners and historians to be demonstrative of key concepts, techniques, or philosophical shifts in the profession. As a result, these works will be endlessly reproduced as the profession’s history is argued, augmented and disseminated to new practitioners. These works suggest a kind of map for how the profession sees itself and invites the public to see its terrain in a similar fashion. To draw from one of your examples, the Bauhaus is significant for so many reasons: it constituted the multidisciplinary workshop, now a key organising format for design studios; it helped define design as something non-contingent on advertising and separate from fine art; and Bauhaus members were among the first to help aestheticise the tools of mass production being used to produce and disseminate design, and so on. Many of these examples are also unusually iconic. Crouwel’s New Alphabet, for example, or Glaser’s I [heart] NY. They are, to borrow a phrase of Mailer’s, ‘advertisements for themselves’. They are also highly formal, and their use of the English language is minimal. So, apart from being brilliant and significant for their own reasons, they show what they mean, travel well to non-English-speaking places, and are relatively easy to copy, quote or appropriate. Those that do copy, quote or appropriate these works both amplify the influence of the prior works and signify that they themselves are part of the ‘in-crowd’ that esteems them. If you made a list of qualities for a canonical work, ‘iconic’ would probably be pretty high on it. It’s interesting to note how many of the projects you cited above are, to varying degrees, self-initiated. This also seems to be an ingredient in canonical works, probably because they are the product of the designer’s efforts alone, rather than a designer plus a client. Q2. Is design history relevant to your own practice? A2. Every designer curates his or her own bookshelf and bulletin board. A mix of canonical and quirky references is healthy and useful. The canon gives you models for certain kinds of things. Glaser’s I [heart] NY, for example, is something we think about, for the way its form and content become a unified and totally dependent whole. Swiss Modernism has a lot to teach about good typesetting. You could do a lot worse than to just copy Hoffman and Müller-Brockmann until you can set Helvetica or Akzidenz Grotesk right. Being aware of design history also helps with teaching, as it gives us a common set of visual references we can share and discuss with students. A3. We’ve both been interested in design for a long time. 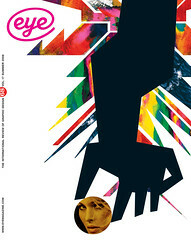 We were readers of Emigre magazine early on and we picked up a lot of design history in school. And we have learned a lot about design’s history from people we’ve worked for, and from trying to write about it and teach. A3. Contemporary students are confronted with an embarrassment of riches on the internet, with blogs and photo sites like Flickr. Our education is ongoing, and we absorb as much of this great wealth of information as we can. The flood of interest in Penguin’s book covers lately has been fuelled in no small part by websites such as AceJet170.com and Flickr pools where collectors can share their libraries. A4. History is really useful in making new work because of the problem-solving models it presents and the assumptions about design values that it contributes to. In trying to work with the printing press, for example, members of the Bauhaus decided not to try to hide that fact but to embrace it and forge a new aesthetic. As a problem-solving model, you can see that idea popping up in design again and again. The Swiss Modernists made an assumption that a certain way of making design was ‘best’ in an almost Utopian sense, and that assumption carried with it certain implications for design that have been debated over the past half century or more. Q5. If you were in charge of a design education programme, what aspects of design history would you teach to your students? A5. Rob Giampietro: I teach a class called ‘Graphic Design & Critical Thinking’ at Rhode Island School of Design, which tries to blend some of the tools of literary criticism with some of the intense modes of observation and description from art history. In the unit on ‘Archives’, we look at the way they are formulated, accessed, subverted and critiqued. We spend a lot of time looking at photographic archives, but I encourage my students to think of design’s history – and particularly its ‘canon’ – through a similar lens. Teaching history as a set of facts is only half the story; history is a system, a process, and students deserve to spend some time thinking about that idea as well. 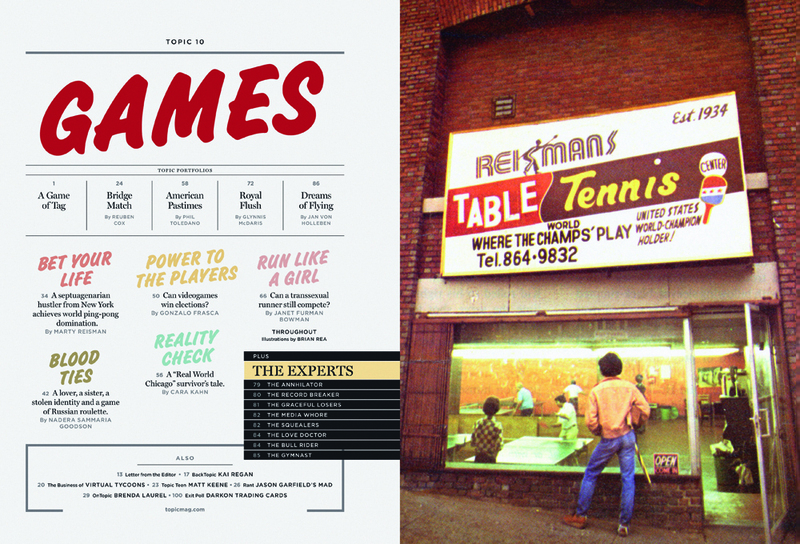 Top: Spread from ‘Topic 10: Games’, 2006 uses a signpainter’s font (Challenge extra bold) against a more rigid grid system to ‘play the vernacular off the modern’. Photograph from the collection of ping-pong legend Marty Reisman. Design: Giampitro+Smith.